John W. Aldridge, MD, F.A.A.O.S. 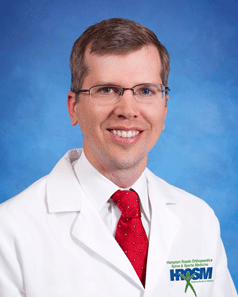 During his time in practice he continues to bring proven, new and cutting edge techniques for spinal surgery and total joint replacement of the hip, knee, shoulder and elbow to the Hampton Roads Community. He was the first on the Peninsula to perform the Axialiff spinal surgery and the Zimmer Gender Specific Total Knee replacement, both of which were featured in the Daily Press. He has instructed other surgeons nationally for both hip and knee replacements and continues to do so for the Anterior Total Hip Replacement. He is also the lead developer for the instruments used for the anterior total hip replacement technique for one of the major orthopaedic companies. In addition to his many interests in the field of orthopaedics, he also serves as a Colonel in the United States Army Reserves. Currently, Dr. Aldridge serves as Medical Director for the Workers’ Compensation Department at HROSM.